Pâté, like caviar, is a dish associated with wealth, but some people don't even know what it is. Mention pâté to those in the know and what comes to mind first will either be expensive gourmet duck liver or chopped liver. Both are correct, of course, but pâté is not limited to poultry. It can be as fancy as you like, suitable for the grandest occasion, or an inexpensive but rave-drawing appetizer at a dinner party. Most pâtés are much simpler to prepare than you might expect. It can be served hot or cold but chilling it for a few days will enrich its flavor. Pâté (pronounced pah-TAY) is French for "paste." It is traditionally served baked in a crust (en croûte) or molded as a terrine. The crust of the en croûte version, interestingly enough, was not originally intended to be eaten. The original purpose of the crust was actually to hold the pâté together. Today, the terms pâté and terrine are often used interchangeably. 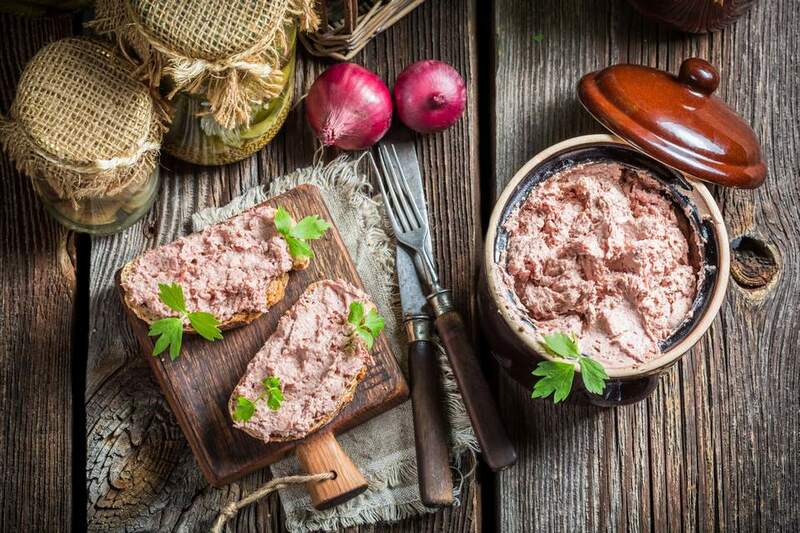 Pâté is simply a mixture of seasoned ground seafood, poultry, meat, or vegetables, and often a combination of several different base ingredients. Beef, pork, liver, ham, seafood, wild game, poultry, and vegetables are all candidates for pâté. The grind can be smooth and creamy or on the chunky side. It may be served hot or cold, molded or unmolded. Pâté is most associated with French cuisine, but variations on this dish can be found all over the world. It's possible that Americans who are unfamiliar with pâté are fans of liverwurst, unaware that the dishes are essentially the same. Liverwurst, especially in sliced form, is a common sandwich filler for many. While the liver is the organ used for removing toxins and waste materials from the blood, that doesn't mean it stores them. It's true that the liver is doing the body's heavy cleaning, but that doesn't make the organ itself dirty or spoiled. The liver actually uses a variety of vitamins and minerals in order to do its important job. These healthy nutrients are stored in the liver, which means it's actually one of the most nutritional organs a person can consume. Pâté, especially when it's made from a fatty liver, is high in fat and cholesterol. The health benefits of the dish usually outweigh the negatives for most people, however. Another benefit of eating liver that was recently discovered is that it combats fatigue. In laboratory studies done with mice, mice that ate even moderate amounts of liver had significantly more energy than those that did not. While scientists aren't sure what exactly it is in the liver that gives such a significant energy boost, one thing is clear—it works!